There’s an ash tree in a corner of our land, a youth really, strident teenager, all lanky growth and fecund fertility. It throws off its keys with profuse thoughtlessness; blocking gutters, fertling their way into preposterously tight spots – lodging tenaciously underneath car windscreen wipers, tightly wedging themselves into window seals and muscling into the etched grips in shoe soles. Yet already, thoughts of chalara fraxinea are a shadow on the horizon just as it on so many blackened stands of this tree: will it find its way to our ash, separated as it is from its breathren or will it manage to keep its head down despite the fact it is reaching ever higher? Certainly the jackdaws will miss it if it goes, the crows too. The jackdaws love Autumn, throwing themselves from the tree into the wind’s blustery vortexes, arcing and laughing as they do, sweeping up and round, wings outspread and curving; an air-fuelled dance with the breeze. The crows look on disdainfully, legs outspread along the fence top, braced, with their chokking caws, guttural, coughing. They would take to speaking Flemish with ease. The rooks though are above it all, aloof and aloft. A small family resident in the ash tree, probably moving into an old nest and then extending it, ignoring the planning laws, The Local Plan and Conservation Officer to boot. The nest certainly looked big from below, we would gaze up watching it grow, the rooks with their straight white beaks and glossy domed heads looking down on us, waiting for us to go. Then tragedy. Violent wind, making the ash keys dance into the air like the crotchets and triplets of a musical melody line penned by nature, levered the nest out too: a finale to the score; the base drum, booming to earth. It landed in the night, the reverberations still felt the next day as the baleful drawn out cries of the rooks had vanished. With their home fallen, they moved on, seemingly without sentiment, their rebuilding must commence, this time elsewhere. For us the legacy was their nest; a prickly-edged oval, close on a metre long, two-thirds across, half deep; its scale up close shocked me. 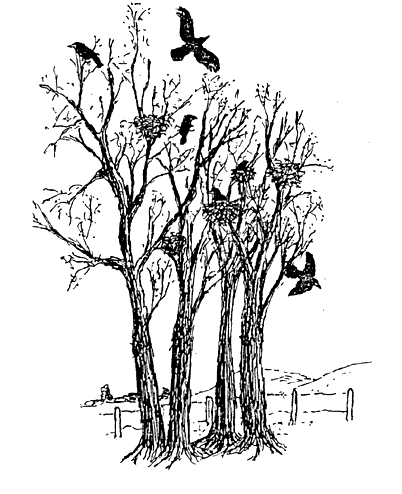 Like most of us, I had only ever seen the nests from afar, a jerky outline of a mess of sticks in a far off tree in a naked winter tree. But this was no jerrybuilt affair – they consulted Building Control after all. Tightly inter-woven with long flexible pieces of ash and dogwood, stripped of leaves and with strengthening braces running down, it was padded out with tufts of moss and wiry dried grass. Not neat and crisp like a wicker basket, but pliant and strong all the same. The wind that dislodged it had been ferocious: it needed to be to upend this home. Now, the ash is home to woodpigeons and a new chorus has begun, the soft breathy woo and coo; the backing singers have stepped into the limelight it seems. Yet, just this last week, I chanced I saw a gothic feathery outline bouncily balancing in a neighbouring willow, a white beak, flashing like an epée this way, then that. Perhaps the rooks’ housing cycle is starting again.